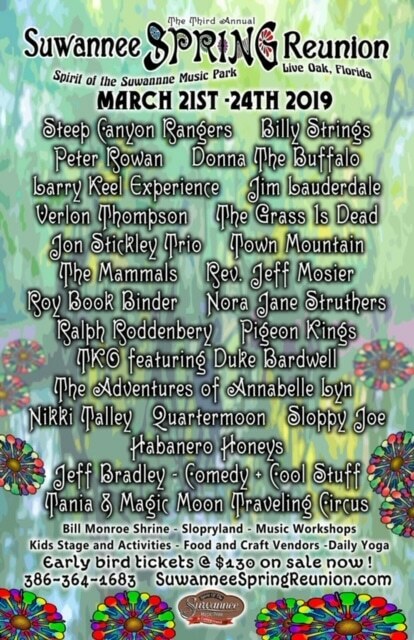 The Suwannee Spring Reunion initial lineup for 2019 features Steep Canyon Rangers, Billy Strings, Peter Rowan, Donna The Buffalo, Larry Keel Experience, Jim Lauderdale, Verlon Thompson, The Grass Is Dead, Jon Stickley Trio, Town Mountain, Rev. Jeff Mosier, The Mammals, Roy Book Binder, Pigeon Kings, Nora Jane Struthers, Ralph Roddenbery, TKO featuring Duke Bardwell, Nikki Talley, The Adventures of Annabelle Lyn, Quartermoon, Sloppy Joe, Habanero Honeys, Jeff Bradley – Comedy + Cool Stuff, Tania & Magic Moon Traveling Circus. More artists to be announced. Steep Canyon Rangers, Billy Strings, Peter Rowan, Donna The Buffalo, Larry Keel Experience, Jim Lauderdale, Verlon Thompson, The Grass Is Dead, and more!